A big "thank you" to my Kickstarter backers! You have made it possible for me to create "Elk Ridge Dig", the centerpiece installation for my solo exhibit at the Urban Institute for Contemporary Arts in Grand Rapids. The exhibit also includes more than 70 individual pieces ranging in size from large bison skulls down to tiny bat skulls. It will run from Oct. 30, 2015 through Jan. 17, 2016. Sculpture made of 82 mink skulls woven together with pearls and seed beads, with hammered copper clasp. "Sandra Wilcoxon’s “Mink Stole” is a warmth-less wrap made of ... bejeweled mink skulls, a memento mori for the ... animals slaughtered for clothing and decoration." Cresated for an exhibit titled "Creature Comforts: Artists' Statements on Life's Luxuries" at Workhouse Arts Center, Lorton, Virginia. On exhibit at the Urban Institute for Contemporary Arts in Grand Rapids, Michigan from Oct. 31, 2015 through Jan. 17, 2016. 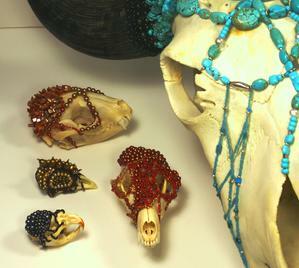 A series of beaded skulls ranging in size from a small songbird to a bison bull. The beads are selected to add whimsy, color and texture to these natural sculptures. The designs also accentuate some of the best features of the skulls, calling attention to fissures that look like a winding riverbed, angular planes like glacier-carved rock, and openings that mimic cavern openings. I want to honor the spirit of the animal; I want the viewer to have fun and respond with a sense of humor or intrigue. TribLocal wrote a story about this unique artwork--read it all at this link. To see a slide show of the skull series, click here. Solo exhibit in Race Street Gallery, welcoming back the first executive director of the Urban Institute for Contemporary Art, Sandra Wilcoxon. The exhibit features more than 70 pieces, including the premieres of "Elk Ridge Dig"--an 'arteological' installation comprising more than 80 skulls and bones--and "Out of Africa," honoring antelopes of the grasslands. Pearls For Good designs show all the colors and textures found in today's cultured freshwater pearls. Organic and earthy, our necklaces are suitable for layering with jeans or dressing up a special occasion. We also produce designs in gemstone, wood and glass beads. All jewelry is handcrafted, no two pieces will be alike, even if based on the same color pattern or theme. A portion of all sales benefits cultural and environmental charities, so you can feel doubly good about your purchase! Due to State of Illinois budget impasse, the Illinois Artisan Galleries and the Illinois State Museum Shop that carried my work and that of hundreds of other artists have been closed. Please contact your state Representative or Senator to urge them to fund the State Museums and the Illinois Artisan program in the next budget. NOTE: Chicago-area clients may contact me directly at info@pearlsforgood.com for custom pieces, repairs or to see newest work. See featured items for sale on etsy.com new items coming soon!